We’re off visiting family in the Adirondacks this week, enjoying a small town Fourth of July celebration, fishing, hiking, playing at the lake, cookouts, and evening campfires with roasted marshmallows, s’mores, and campfire pies. We’ll return in a few days feeling rested, a little sunburned, and ready to resume work in the garden, which hopefully won’t burn up in the current heat wave. After harvesting our garlic scapes at the end of June, we took them to the kitchen and set to work making pesto, a pasta dish, and bean dip. 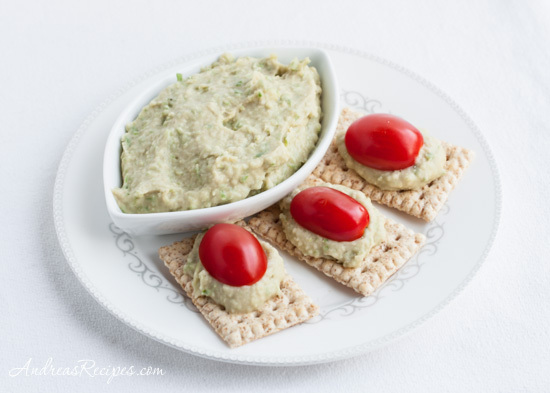 The scapes were spicy—really spicy—and added a nice punch of garlic flavor to this simple bean dip. After a couple bites Michael grabbed some grape tomatoes and put the halves on top of the dip and it made a great combination. If your scapes are as spicy as ours were, you could even add some fresh flat leaf parsley to the mix to balance the flavor. 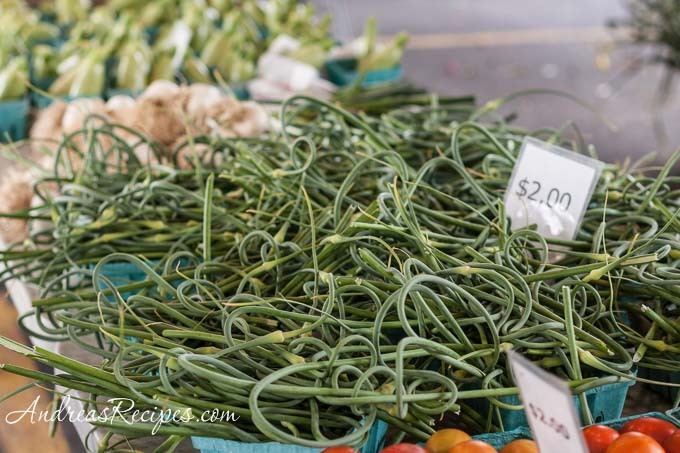 If you aren’t growing garlic at home, you may find garlic scapes at your local farmers market. We spotted some at the Central New York Regional Market over the weekend, so keep your eye out for them, but if they are out of season you can substitute a few fresh garlic cloves. 2. Add the lemon juice, sea salt, and black pepper and process until the dip is thick and creamy. If the dip is a little dry, add 1 to 2 more tablespoons of olive oil and process. Serve with whole grain crackers or sliced baguette. You can also use about 5 or 6 fresh garlic cloves instead of garlic scapes. If your scapes are very spicy, you can reduce the amount or add some flat leaf parsley to balance the flavor. This dip looks great! Cannellinis are my favorite kind of beans. I’ve got to get my hands on some garlic scapes. I’ve never seen them anywhere around here. Hope you all are have a nice relaxing vacation! Hope you have a great vacation. This dip sounds wonderful. looks wonderful! i think all pulses are overlooked in my household, i didn’t grow up with them and including them in my diet doesn’t come naturally. i have so many beans to use up before we go, this recipe is definitely a big help!!! I love your use of garlic scapes in this fun dip. White beans go well with so many different flavors. I’ve also been admiring your gardening…I’m in the learning process and going through quite a learning curve. I made this yesterday, only I didn’t have scapes on hand, actually, I’ve never used them, and added white pepper for more spice. Wow! It’s really delicious. I think the parmesan cheese is what nailed it for me. Thanks! Made this recipe today after trying to figure out how to use the garlic scapes from our CSA share, and it was very delicious. Pretty sure my breath is killing those around me, but worth every delicious bite! My daughter gave me some dip made with garlic scapes from her garden and cannilli beans. Sure hope I fine some garlic scapes at the farmer’s market tomorrow!